Congratulations! Your wedding day will be one of the most important days of your life. 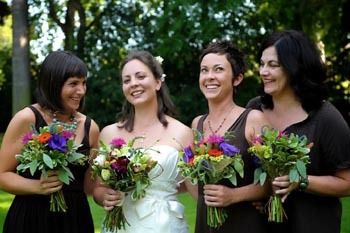 We are excited to work with you and design wedding flowers that will exceed your expectations and your dreams. Every Broadway Floral wedding begins with a complimentary consultation. Our wedding specialist will guide you through an initial consultation, listen closely to your ideas and desires, prepare a detailed proposal and oversee the hands-on creation of your flowers. Whether you are looking for something unique or classic, our designers will create your perfect wedding flowers and transform your wedding into a spectacular event. We recommend scheduling your first consultation between 3 and 9 months prior to your big day, once you have selected a venue and color palette. This timeline is simply a suggestion and we would be pleased to speak with you whether your wedding is next month or next year. To make an appointment call us at 503-288-5537.